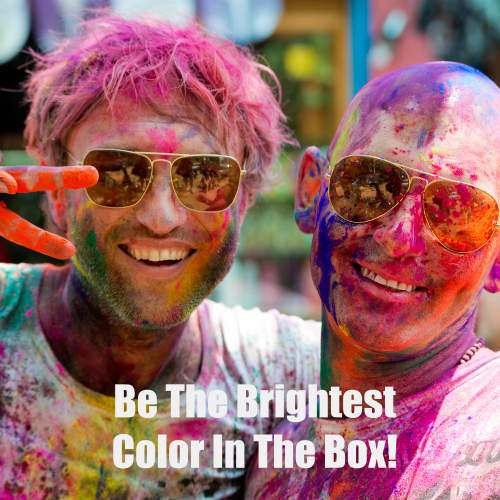 Your fundraising just got color-bombed! 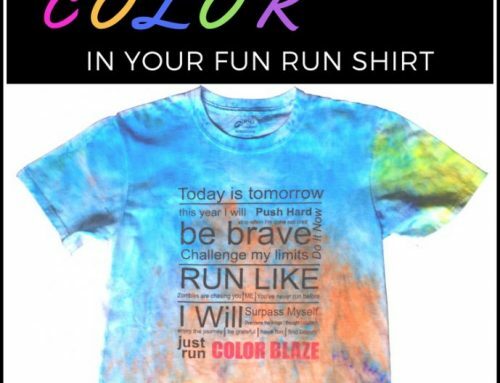 Color Blaze Runs have always been a great activity for fundraising and to raise money for charitable organizations, schools, churches and more. 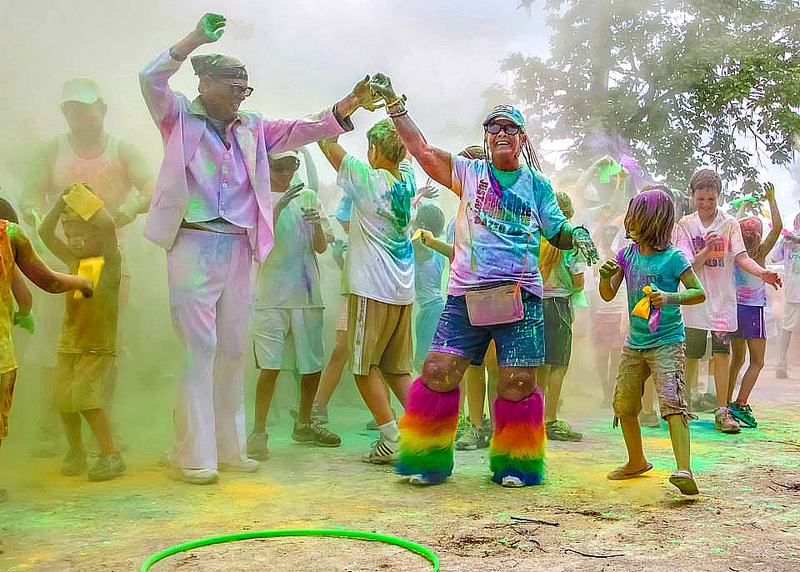 Add a splash of color and host a Colorful 5k Run that gives your fundraiser a colorful boost! How Does a Color Blaze Run Work? 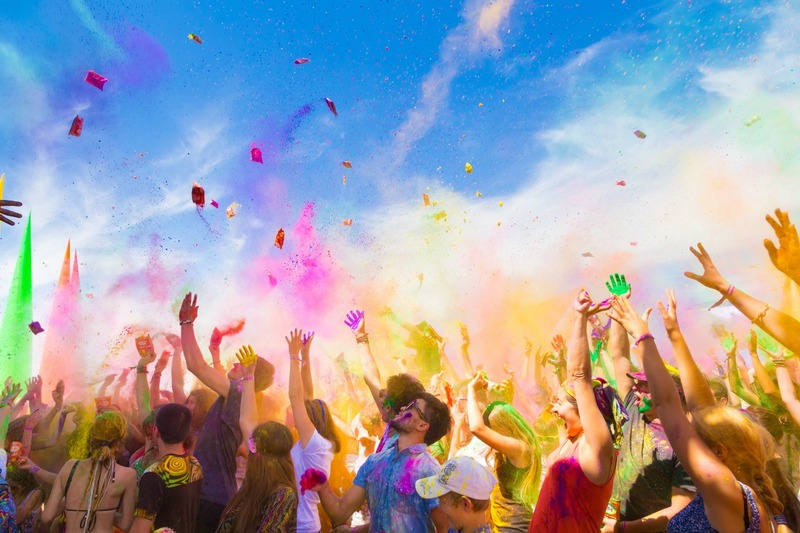 What Is A Color Blaze Run? 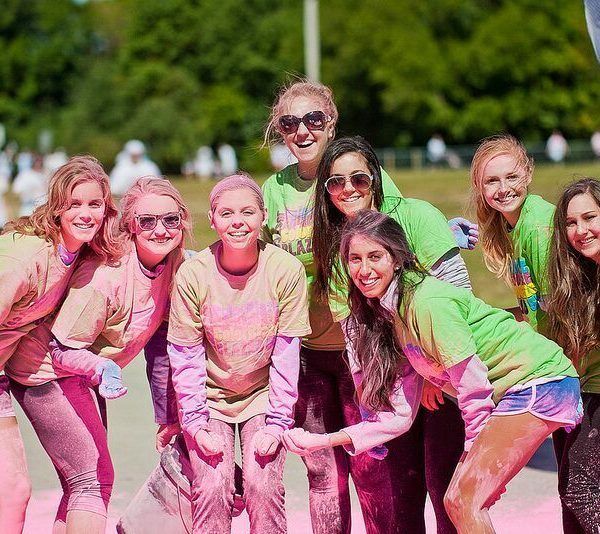 If you’re looking to host a Color Blaze 5k run, typically a course is laid out with 3 to 5 color stations set up with color powder that will be thrown on the participants as they run through the color station. A color station is usually a small table on either side of the course with buckets of color powder. To organize the best run, you’ll need to get about 4 volunteers per station to actively throw powder on your racers as they pass through the color station. 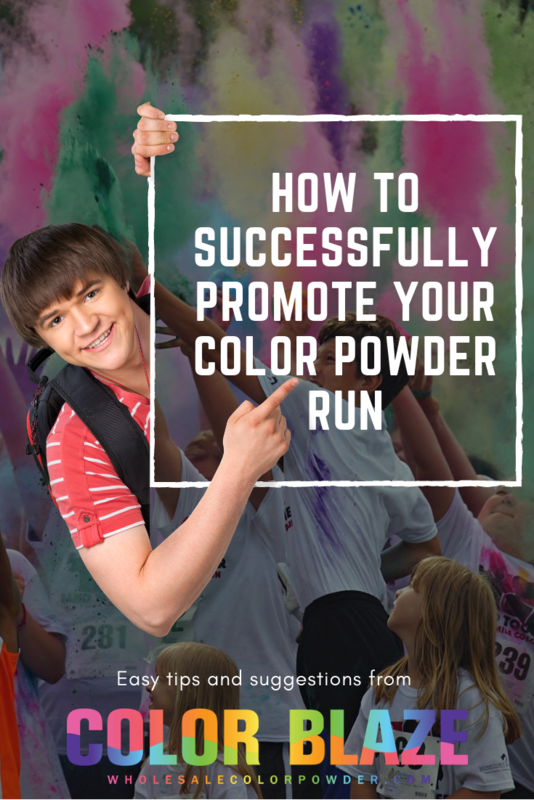 There are two preferred methods of throwing the color powder. One is to use small dixie cups to dunk in the color powder and throw on the participants. The other is to use condiment squeeze bottles, fill them with powder and squeeze as the runners go by. Remember to always aim from the shoulders down – you never want to throw directly at someone’s face, always avoid the face and eyes. Most of our customers choose to use one color per station – but it is entirely up to you! Color! The Most Important Part! 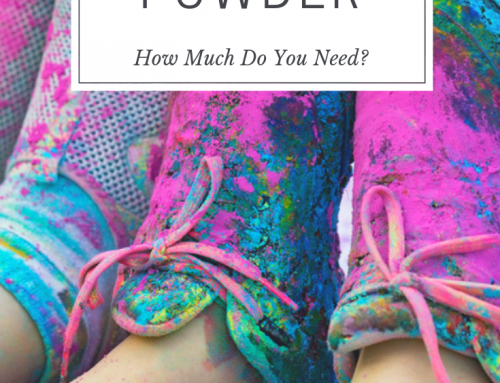 How much Color Powder do I need? Each station usually consists of one color. For example if you have 3 color stations – one station might be blue, one might be yellow and one might be pink. 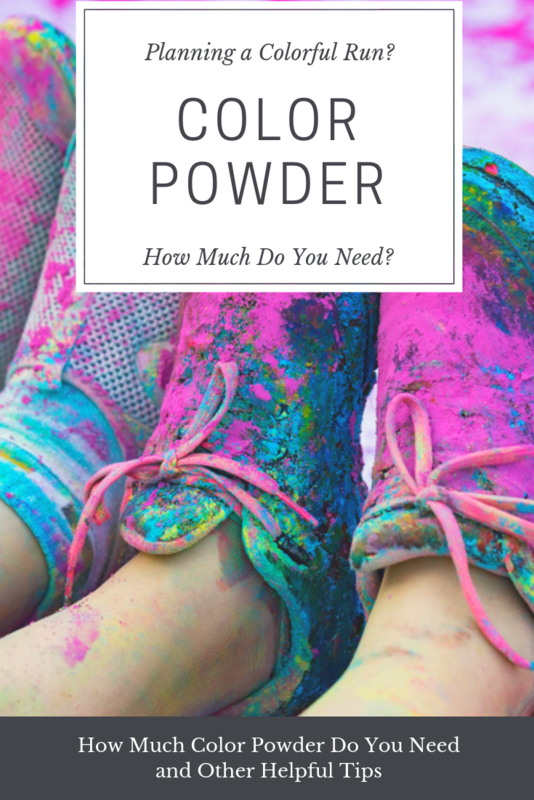 If you plan on having multiple colors at a station you will use much more powder than the recommended quantities listed below. 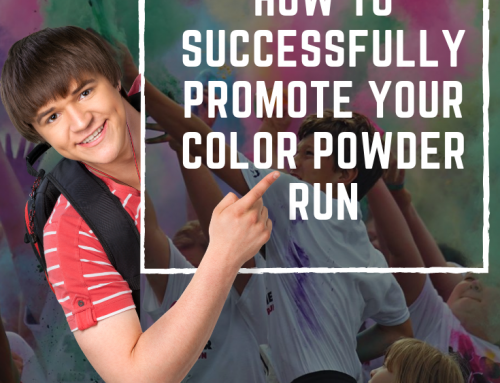 For example if you have 100 participants and you have 3 color stations you would need at least 50 pounds of color powder. If you really want to cover (literally) your participants you may want to order a bit more to insure you have some happy colorful campers at the end of your run. Color Powder is typically sold in 25 pound bags. 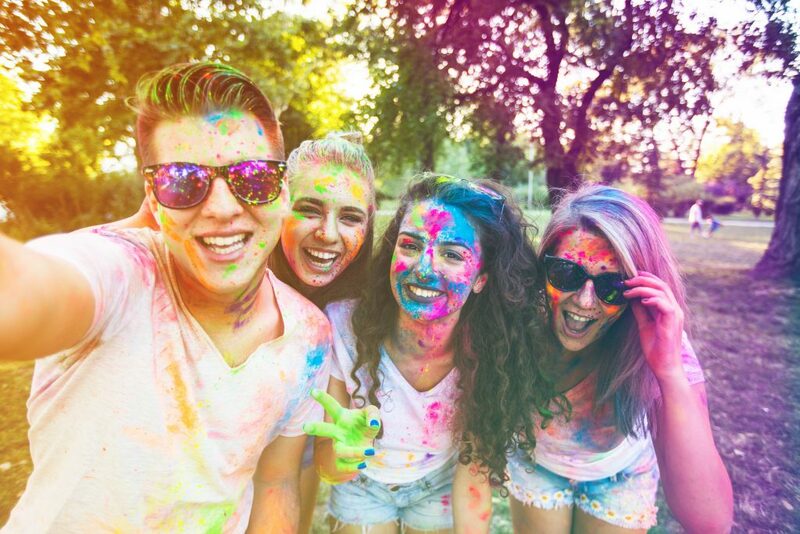 Have a colorful celebration at the beginning or end of your color event! 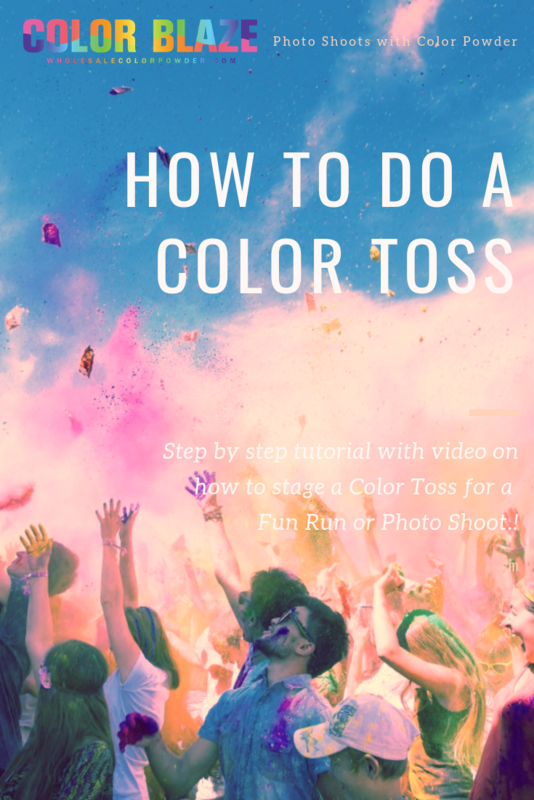 A Color Toss is a great way to start your race and/or end your race. 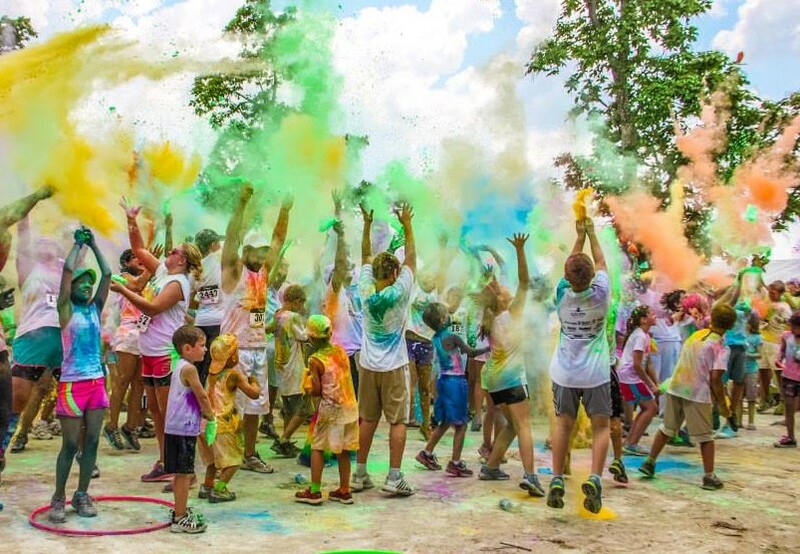 This is when all of the race participants gather together and throw color into the air! Individual powder packets are perfect for a Color Toss! 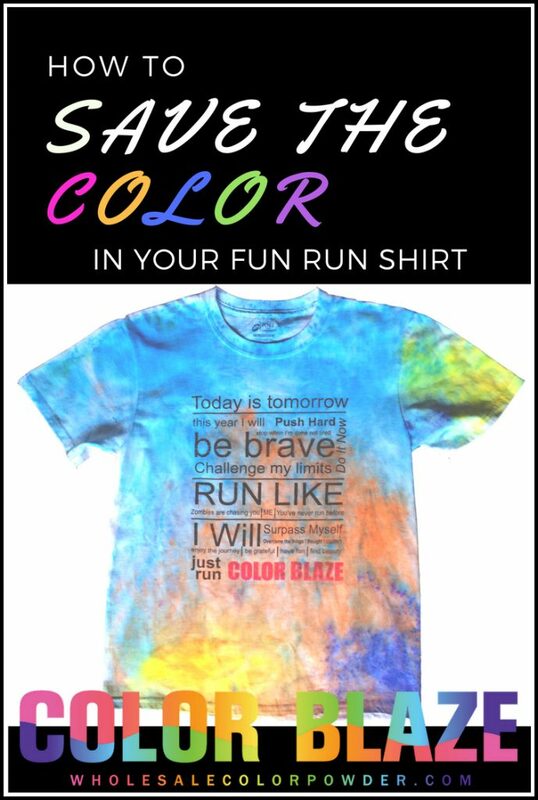 An online fundraising platform is by far the easiest way to raise money with your Color Blaze 5k run. There are many online platforms available for this purpose. 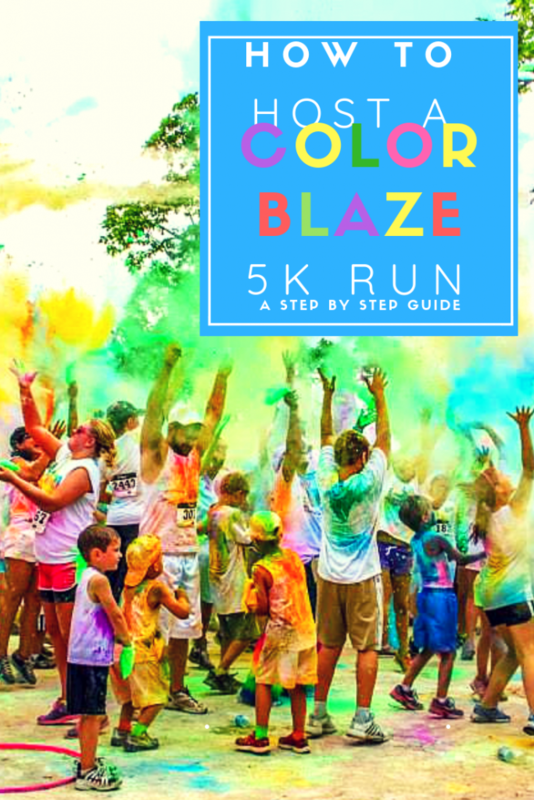 Color Blaze has their own online fundraising platform called BlazeRaise that is specifically designed for fun runs. It is a super easy tool for school fundraising. You just add your participants and our platform creates an individual fundraising page for them. They can easily email it to family and friends and share on social media. It makes donating easy for everyone – you just click on a link to donate securely with your credit card. The more people you can reach and the easier it is to donate the more money you will raise. Online fundraising platforms in general typically raise double the amount of paper based fundraisers. Find out more about BlazeRaise. But Wait! 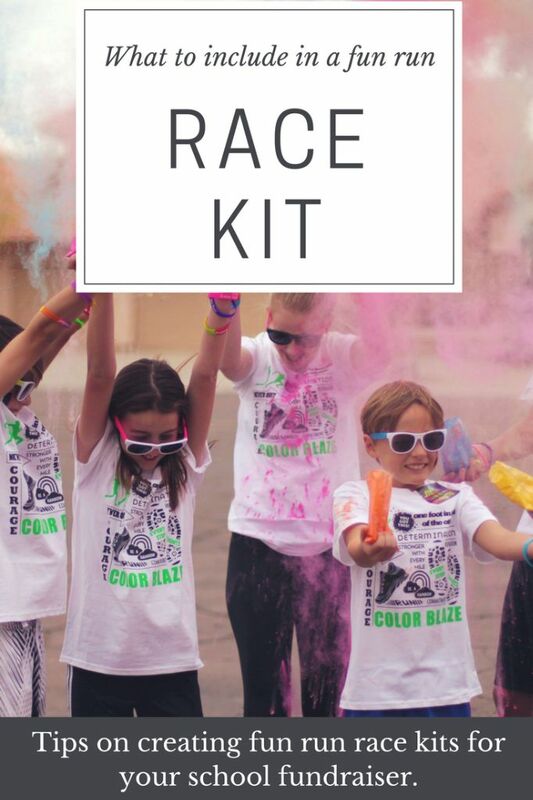 There’s MORE!For every Color Blaze Race Kit ordered you get 1/2 pound of free color powder! For example, if you order 50 race kits you will get 25 pounds of bulk powder with your order! 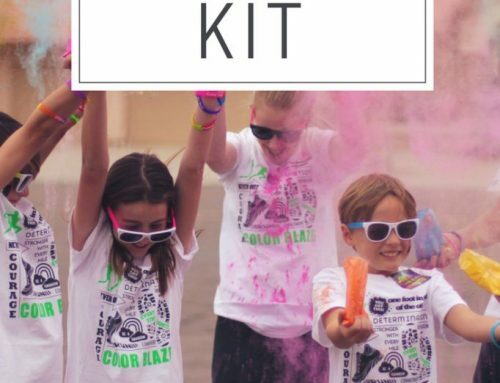 So depending on how many color stations you have it’s possible to provide your runners with a t-shirt and fun race day swag along with a personal color powder packet for each runner for your color toss and your bulk powder for the run at just $12 per runner. For fundraising purposes it is up to you how much you make from race kits. If for example you charge $20 for registration and each race kit costs $12 you would raise $8 per runner, if you charge $25 for registration you would raise $13 per runner etc. Having local businesses sponsor your race or donate goods to your race is also a great way to raise funds and/or offset costs. You can have potential sponsors sponsor the entire event or just a color zone (similar to a golf outing where a business sponsors a hole, in this case a sponsor will have a sign at a color zone.) You can make sponsorships available for the start line and finish line or a business could donate water bottles and sponsor a water station! The possibilities are endless in terms of raising additional funds through sponsorships. Start Line – depending on the amount of participants you have you may want to consider breaking the runners up into “waves” of 25/50/100 participants at a time. You can wait approx. 90 seconds and then release the next wave and so forth. This will help with congestion at the color stations ensuring everyone has equal opportunities at the stations. Finish Line – This is the time where most of the photos will be taken. With the amazing power of social media, create your own custom hashtag (i.e. we use #ColorBlaze keep). People love sharing their photos and this will link all back to your event. Blow Off Station –Offer a blow off station, this can be anything from an electric leaf blower, large fan or floor dryers. Place the blow off station near the parking lots so folks can clean up before returning to their vehicles. We recommend patrons show up at least an hour prior to the event so they can enjoy any pre-race activities you have planned and ensure you have enough time to get everyone signed in. Typically most 5k run’s only need two water stations one in the middle of the course and one at the finish line. This does not have to be anything fancy, a clean folding table and cups of water will do the trick. If you have a local company that is willing to donate water bottles in exchange for sponsorship they may also be willing to hand out the water bottles at water stations to the runners/walkers. 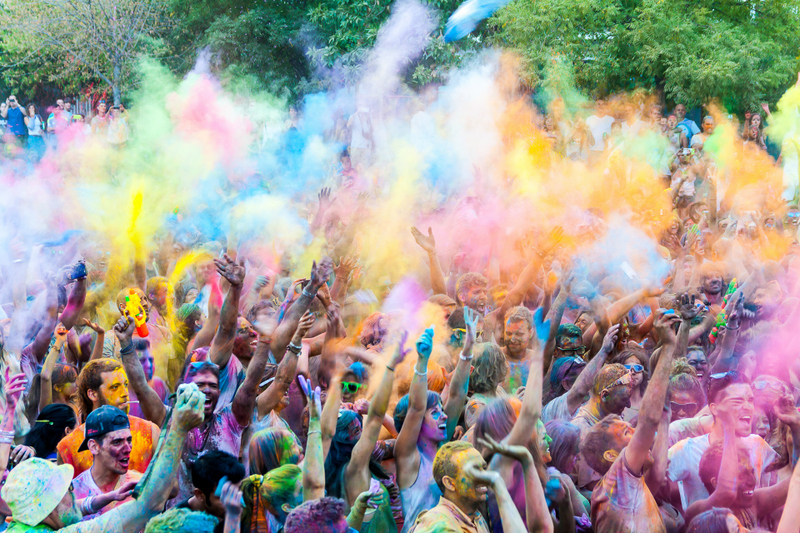 When it comes to organizing a Color Blaze Run, clean up is the easy part! Simply pick up all of your trash and sweep up as much color as you can. The remaining color will leave no more than a sidewalk chalk like residue that can be easily rinsed away with a hose. 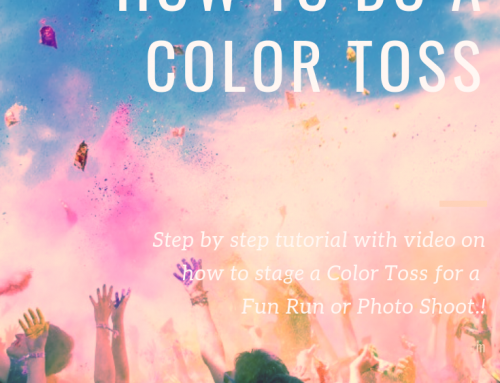 You may also want to recommend that participants bring towels to place in their cars so they don’t shake color powder all over the interior of their car and have to clean up later. For clothing – simply shake off the excess powder and place in the washing machine. Skin and hair – nothing a quick shower won’t take care of! Permits – make sure to check with your local city for any permits you may need if your event is not on private property. Even if its an event for a fundraiser or for charity, you still need to get permissions. Safety – consider having an EMT on site. If the event is large enough, you may want a couple law enforcement officers on location. You should also have fire extinguishers on hand. It’s good to always be prepared for anything and to cover yourself as the host of the event. Restrooms – make sure your location has restrooms that are easily accessible by race participants. Music – what is an event without music?!? Great music keeps your crowd pumped up and a good vibe in the air. Race day activities – You may want some pre-race activities, participants have enjoyed a Zumba workout show, dance offs, raffles, give-aways etc. before the actual race starts. Just about anything will work as long as it adds a little excitement to the event while patrons are waiting for the start of the race. Please note: We are not responsible for how you produce your event, please follow all governmental regulations. Never use color powder in an enclosed or congested environment. Never throw in or towards someone’s face. Always recommend safety glasses and dust mask. Have a MSDS sheet present during events. Have a fire extinguisher on hand and NEVER use near an open flame or excessive heat sources.